Mikelle Moore has been a part of Intermountain Healthcare’s leadership team for over 19 years. In April 2017, Mikelle joined the Executive Leadership Team as Senior Vice President of Community Health, where she leads system-wide prevention and community health improvement efforts and oversees the population health efforts in support of Intermountain’s mission of helping people live the healthiest lives possible. 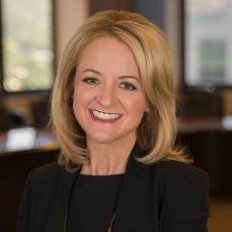 Prior to this role, she was Vice President of Intermountain Healthcare Community Benefit and continues to serve as the President of the Intermountain Community Care Foundation. Intermountain Healthcare is a not-for-profit health system of more than 39,000 employees based in Salt Lake City, Utah, with 22 hospitals, about 1,100 employed primary care and secondary care physicians at more than 185 clinics in the Intermountain Medical Group, a broad range of clinics and services, and health insurance plans from SelectHealth. Previously, Mikelle served as the 13th Administrator of Intermountain’s LDS Hospital—and first female administrator—from 2004 to 2011. She joined Intermountain as an Administrative Fellow in 1998 after working in a provider-owned health plan and at the Mayo Clinic in Arizona. Mikelle is a certified Fellow in the American College of Healthcare Executives and serves on the Advisory Council of the Association of Community Health Improvement. She is active in numerous community organizations, and she currently serves on the Boards of the United Way of Salt Lake, The Children’s Center, Maliheh Free Clinic, and Salt Lake CAP Head Start. Mikelle also serves on the State of Utah’s Health Disparities Advisory Council and the Salt Lake City Homeless Commission, and she served on the Charity Care Committee of the Utah Health Reform Task Force as the state considered Medicaid expansion. Mikelle enjoys being active in the natural beauty of Utah and traveling with her nine-year-old daughter and seven-year-old son.